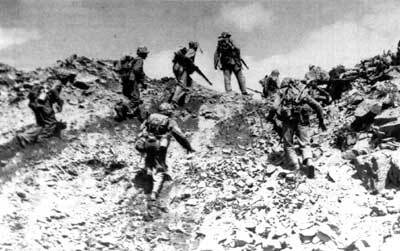 Before the 28th Marines (from the 5th Division) made a left turn, to take Mt. Suribachi, they sustained casualties on “Red” and “Green” beaches. Some of the boys, trying to offload their ammo carts, were killed before their feet reached the shore. Heavy equipment became bogged-down in the volcanic-ash beach. Dubbed “Hotrocks” by the invaders, Suribachi was heavily defended. Like other places on the island, it was hard to reach the top because the ground had been “chewed-up” by all the bombing. But something amazing happened as two four-man Marine patrols tried to figure out the best routes up the mountain’s north face. The vicious fighting, they had all expected, did not happen. One of the patrols, led by Sgt. Sherman Watson, made it to the top. The men were able to look inside Suribachi’s crater before they scrambled back to report what they’d seen. It was time to send up an assault patrol. Captain Dave Severance selected the 3rd Platoon from “Easy Company,” 2nd Battalion, which had been badly hit (almost half the platoon had been killed or wounded since the start of the Iwo campaign), supplemented with machine gunners and mortar men. Severance thought he could be sending forty men to their deaths. First Lt. George Schrier, Severance’s executive officer, would lead the patrol. “Boots” Thomas, senior enlisted man of the 3rd’s twenty-five survivors, was the platoon sergeant. Lt. Colonel Chandler Johnson (28th Marines, 2nd Battalion) had something he wanted left at the top of Suribachi, if the men made it there. It was an American flag, measuring fifty-four by twenty-eight inches, which had been aboard the USS Missoula. He gave the flag to Schrier. A photographer for a Marine publication called Leatherneck Magazine, Staff Sgt. Louis Lowery, went along. If the patrol got to the top, he would record what happened. It was one thing to have four men in a patrol inch their way up Suribachi, without encountering serious gunfire. But forty men, zigzagging their way to the top in single file, was like giving the island’s defenders material for target practice. Given the mountain’s steep slope and rugged terrain, how could the patrol get all the expected casualties back to the beach? The Marines had flame throwers (move the video forward to 2:75 to see how flame-throwing worked) with them, plus a Navy medic who’d been assigned to the Marines. The group thought they would encounter enemy fire at any second. Maybe somebody would step on a mine. Maybe someone else would be the victim of a grenade. But once again, despite all the defenders around them, they made it to the top without incident. The ascent took about forty minutes. Along the trek, Lou (who lived until 1987) took pictures with his cumbersome camera. At some point, he asked to see the flag as it was carried up. When they reached the top of Suribachi, the patrol found pieces of Japanese pipe on the ground. It had likely been used to catch, and carry, rainwater. One of the longer pieces had a hole in it, probably from a bullet or shrapnel. The hole in the pipe made it a perfect flag pole. Pl.Sgt. Thomas, 1st Lt. Schrier, Cpl. Charles W. Lindberg and Sgt. Hank Hansen tied the colors in place. Lowery asked Pfc Jim Michaels to crouch down with his carbine. Pfc. Ray Jacobs (some accounts say Louis Charlo) joined the others as the Marines raised the first foreign flag ever to fly on Japanese soil. It was 10:20 in the morning, 23 February 1945. Shouts of joy erupted all over the island. Navy ships sounded their horns. But that flag raising is not the one the American public celebrated. The famous Iwo Jima photograph, taken by Associated Press photographer Joe Rosenthal, was taken a few hours later - as a different group of flag raisers hoisted a replacement flag at the top of Suribachi. Bos, Carole "A FLAG-RAISING ON SURIBACHI" AwesomeStories.com. Oct 01, 2006. Apr 21, 2019.